Sustained ocean observations are crucial to track and understand the complex and vast oceanic environment, providing data, products and services to underpin a knowledge-driven society. But are we doing enough to optimize existing efforts for future generations and what should Europe's contribution be to the Global Ocean Observing System? Through its pan-European network, the European Marine Board provides expert advice from the European marine scientific community in the areas of ocean observation and Marine Research Infrastructures (MRIs) to inform marine research policy and strategic planning. EMB activities to date include publication of foresight papers (e.g. EMODnet vision document, Navigating the Future IV, chapter 11), policy statements (e.g. EurOCEAN Declarations), responses to European consultations (e.g. Marine Knowledge 2020), and an active role in European ocean observation projects (e.g. H2020 AtlantOS). In 2016, EMB will launch a Working Group on Strengthening Europe's biological ocean observing capability. Throughout its activities EMB works with relevant networks and initiatives, including EuroGOOS, ESFRI, EMODnet, Copernicus CMEMS and JPI Oceans. There is a growing recognition of the need to build a comprehensive, end-to-end European Ocean Observing System (EOOS) to coordinate the currently fragmented and complex ocean observing capacity across Europe. In 2015, EMB and EuroGOOS launched a joint activity on EOOS as a framework for advancing Europe's capability for ocean observation. On 12-13 May 2015, a joint workshop was held in Brussels bringing together experts from the marine scientific and operational oceanographic communities to develop a roadmap, time-line and governance structure for EOOS. This was convened with the long-term goal of implementing a flagship initiative building on existing resources and commitments and aligning with international developments such as the Framework for Ocean Observing. In particular, in Europe, there is a growing recognition of the need to build a comprehensive, end-to-end European Ocean Observing System (EOOS). In 2015, EMB and EuroGOOS launched a joint activity on EOOS, bringing together the marine scientific and operational oceanographic communities to develop a roadmap, time-line and governance structure for EOOS with the long-term goal of implementing a flagship initiative building on existing resources and commitments. An expert workshop was held in May 2015 (see images below), and a dedicated website for EOOS has been launched. In 2016, after a successful workshop, EuroGOOS and EMB convened a panel to act as an EOOS Steering Group. On 8 September 2016, EOOS progress and a consultation document were presented at a dedicated European Parliament event hosted by MEP Ricardo Serrão Santos. 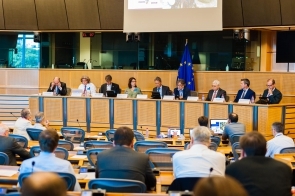 EOOS European Parliament event, 8 September 2016, Brussels. Based on advice by the EOOS Steering Group, EuroGOOS and EMB held a joint public stakeholder consultation on EOOS between December 2016 and January 2017, using a dedicated consultation document. The consultation collected views from the European ocean observing community and wider stakeholders spanning policy, industry and national agencies, on what EOOS should look like and how it should be run. The consultation aimed at scoping the stakeholders’ buy-in to the EOOS concept and the priorities of the EOOS focus. In total 115 responses were received, and the vast majority of the respondents endorsed the EOOS concept and the need for a coordinating framework for the European Ocean Observing. An overview of the consultation results is available now available. The concept of a truly end-end European Ocean Observation system was first formally endorsed at the EurOCEAN 2010 conference where the resulting Ostend Declaration called for policy makers to "Support the development of a truly integrated and sustainably funded European Ocean Observing System to establish Europe's global leading role." And in June 2013, EMB published Navigating the Future IV, with chapter 11 dedicated to 'EOOS'. This set out four pillars for an end-to-end EOOS, namely stakeholders, infrastructure, data services and outputs (products and services).